Spiced Quinoa Apple Pie Parfait. When I found honeycrisp apples at the store yesterday, I was so excited I thought I might burst. Caramelizing them was really the only thing I had in mind. Well, that… and eating them with a pound of bacon. Don’t ask. This parfait was totally new to me. A few weeks ago Brittany made a quinoa parfait that looked so delicious that I couldn’t get it out of my head. Greek yogurt isn’t new to me, and neither is quinoa, but the combination of the two is. And the texture is fabulous. I wasn’t so sure about using the quinoa in a non-savory fashion, but I am so glad I did. Oh, and I didn’t make the parfait for him. Though it may have softened the blow of technology. Not only did I love the texture of this parfait, but it offered a boatload of protein in forms that I actually enjoy, some whole grains and sweet, juicy fruit! Doesn’t get much better in my eyes. The more my everyday food tastes like dessert, the better. Combine chopped apple, brown sugar, 1/4 tablespoon cinnamon, 1/4 teaspoon nutmeg and 1/4 teaspoon salt in an oven safe dish. Roast apples until soft and caramelized, about 15-20 minutes. Combine dry quinoa with remaining cinnamon, nutmeg and salt. Cook according to directions. When apples and quinoa have cooled (not completely, but they shouldn’t be scalding) layer in a glass with greek yogurt. If desired, mix yogurt with cinnamon and honey for topping. Our Favorite Sweet Potato Fries. Jessica, this looks gorgeous! Totally my kind of dessert :) Will try something like this myself when the summer berries start to arrive down here. Thanks! Could this look more perfect? Probably not! What a great way to use quinoa! Can’t wait to try this! You made this just for me, didn’t you? I love how healthy this is too! I wouldn’t have expected quinoa and greek yogurt either, when I first saw the picture, I thought it must be a granola or something. This sounds fantastic though! I like it as a parfait but I think I might make it more as a sweet side dish. Yea on the honeycrisp apples too! I can’t wait until they go on sale! Thanks! Btw the quinoa and greek yogurt this is super protein packed. Looks delicious! This is an awesome combination. I would have never come up with it either! These photos are amazing!!! This looks awesome. About a year ago, I made a big batch of coconut quinoa [just put in 2T of coconut oil when you cook 1c of quinoa] and topped it with fruit, yogurt, etc. It was so so so good! I need to do that [or this] again! looks pretty healthy!! i happen to have lots of apples, gotta try it sometime!! Question about the ingredients. The list has 1/2 Tbls cinnamon and the directions say 1/4 Tbls. Same thing with the nutmeg and the salt, directions have half the amount of the list. I don’t want to blow this first time out or overdo it with the spices. Please let us know which is correct. Thanks so much, okay I’m off to the store for some quinoa. 1/4 of the cinnamon is for the apples, the remaining cinnamon goes into the quinoa! Love this! In the cafeteria at work they serve quinoa and cous cous for breakfast occasionally. It’s sooo good, but sometimes I think I am the only one who has disovered it or they would probably make it more often. I think they cook it in a ton of cream and sugar so I am sure that is why it’s so good. This looks great though. 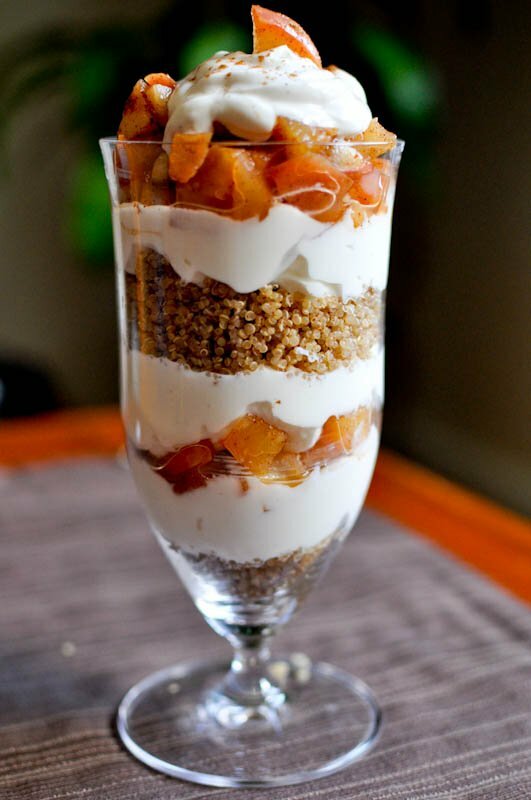 I love the combo of greek yogurt, fruit and something carby/crunchy – yum!